Clinical and other biochemical studies of trace metals depend upon accurate and precise methods of analysis. A review of the history of aluminium-related diseases  indicates that it was the measurement of aluminium in brain and other tissues that led to the proposal that this metal was a causative agent responsible for the condition now recognised as dialysis encephalopathy . An early study showed that the bones of Newcastle dialysis patients contained both an excess of aluminium and an excess of fluoride compared with patients who had been dialysed in other treatment centres . 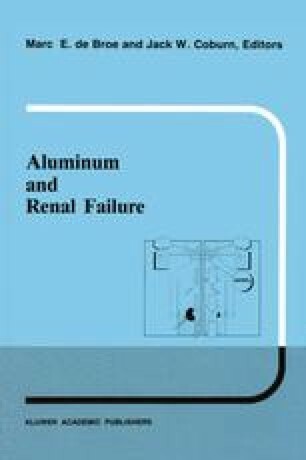 Likewise, it was the discovery of high aluminium concentrations in the water supplies of geographical areas coincident with the dialysis centres with the greatest incidence of dementia and dialysis osteodystrophy that provided crucial evidence in identifying the major source of aluminium exposure for haemodialysis patients .